Hereville: How Mirka Met a Meteorite by Barry Deutsch. Amulet, 2013, 144 pages. Hollywood, Dead Ahead (43 Old Cemetery Road) by Kate Klise and M. Sarah Klise. Harcourt, 2013, 144 pages. My Friend Dahmer by Derf Backderf. Abrams Comicarts, 2012, 224 pages. at the time. Smart, sad. Peanut by Ayun Halliday, illustrated by Paul Hoppe. Schwartz & Wade, 2012, 216 pages. by Mike Townsend. Dial, 160 pages. Celebrate at will. 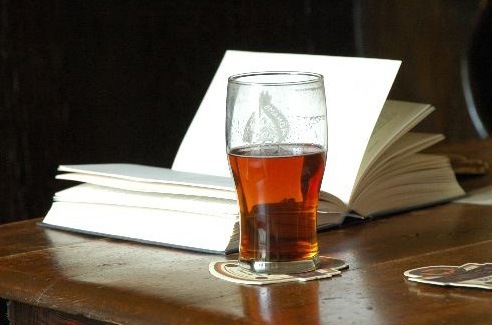 I recommend a good book and a good beer. hankies -- and lint brush. White Fur Flying by Patricia MacLachlan. McElderry, 2013, 128 pages. try their hands as rock stars. The Popularity Papers #5: The Awesomely Awful Melodies of Lydia Goldblatt & Julie Graham-Chang by Amy Ignatow. Amulet, 2013, 160 pages. Lulu Walks the Dogs by Judith Viorst, illustrated by Lane Smith. Atheneum, 2012, 160 pages. Fake Mustache by Tom Angleberger. Amulet, 2012, 208 pages. My Brother's Book by Maurice Sendak. Harper, 2013, 32 pages. As of this morning, I'm now an agent with Wernick & Pratt Agency LLC. Marcia and Linda were my colleagues, bosses, and mentors at my very first job, and I'm delighted to come full circle and work with them again. Visit me, and the agency, at www.wernickpratt.com. The Dunderheads Behind Bars by Paul Fleischman, illustrated by David Roberts. Candlewick, 2012, 48 pages.